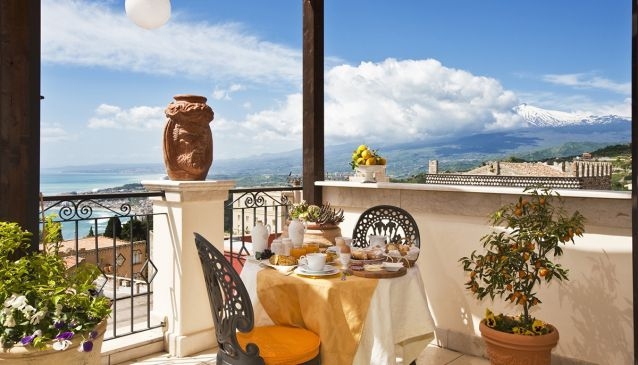 Hotel Taodomus is a small and elegant boutique hotel located in the centre of Taormina. With only 10 cosy rooms Hotel Taodomus is the perfect location for those seeking a refined and surrounding, and it is for travellers who like to spend their holidays in a historical backdrop and a lively place. The best feature must be the charming panoramic terrace, where guests can enjoy the gorgeous view of Mount Etna and the sea while having breakfast in the morning, or a drink in the evening.. During the day, the terrace becomes a lounge area. The friendly staff gives guests a cordial welcome and do their best to ensure a peaceful and relaxing stay. Please refer to My Guide Sicily when contacting Hotel Taodomus.